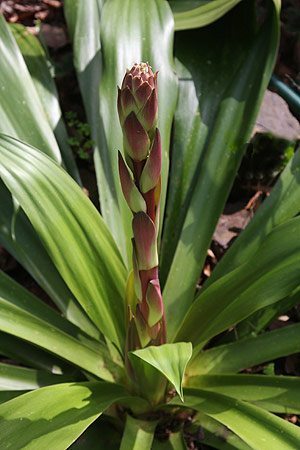 From Mexico Beschorneria septentrionalis with its glossy starp leafed foliage and tall flower spike in spring is a wonderful structural plant for the garden or container. With an exotic or ‘tropical look’ this is plant that prefers a dry part shaded position, which makes it a most versatile performer. Evergreen and taking a few years to flower, the rosettes of roliage will spread to around 1m and reach around 80cm in height. The towering flower spikes will reach around 2m. Masses of small pink flowers tinged with green on red stems make it a standout when in flower. Best in full sun although part shade during summer in warmer climates, as long as winter and spring sun is good flowering seems successful. Although Beschornerias eptentrionalis copes with a range of soil conditions it does prefer a humus rich fertile soil and will benefit from a slow release fertilizer applied in spring. Spent flower heads can be removed as needed. Drought tolerant once established.